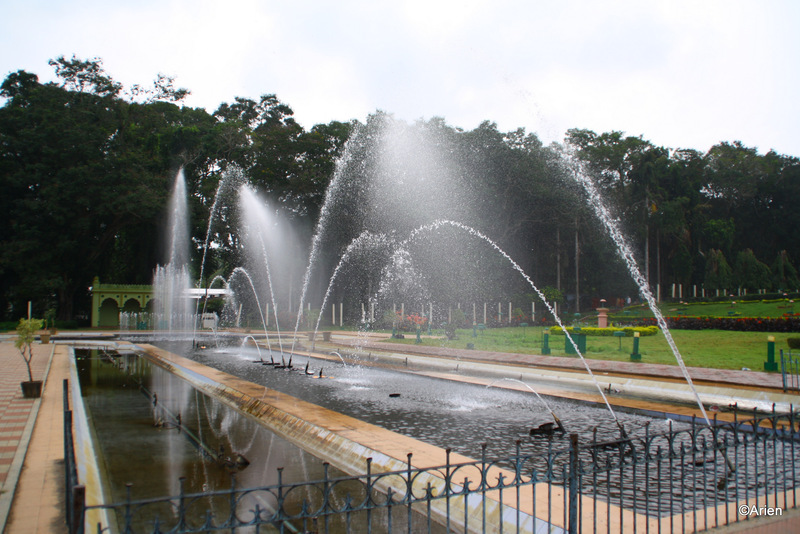 A visit to Mysore is never complete without a visit to the Zoo. In the years following this trip, the zoo trip will become all the more important since we’ll have a toddler accompanying us everywhere. Anyway, this was before the toddler arrived and from when we were the happy-go-lucky couple who enjoyed traveling and doing all things touristy. Anyway, I loved the zoo because I could see the Giraffes and it was one helluva walk. This time was no different. I wanted the Arien to take some pictures of the animals and birds in the zoo. 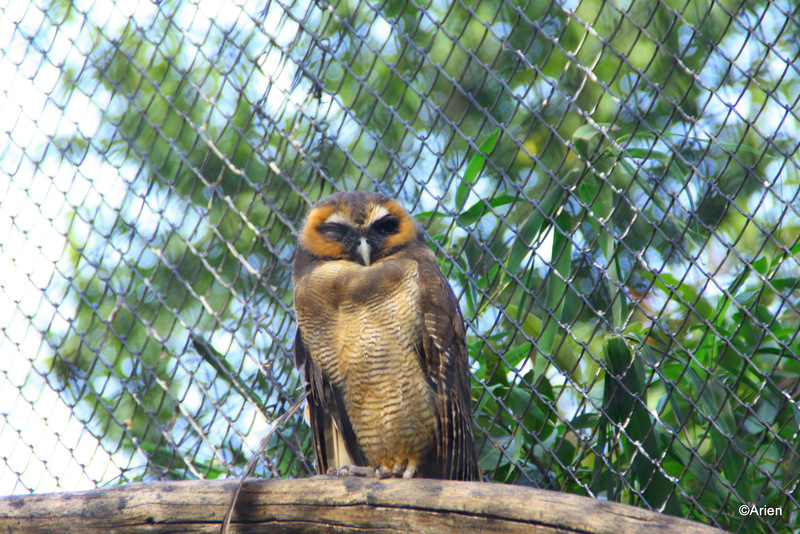 The first picture was of the glass-eyed stern-looking owl. 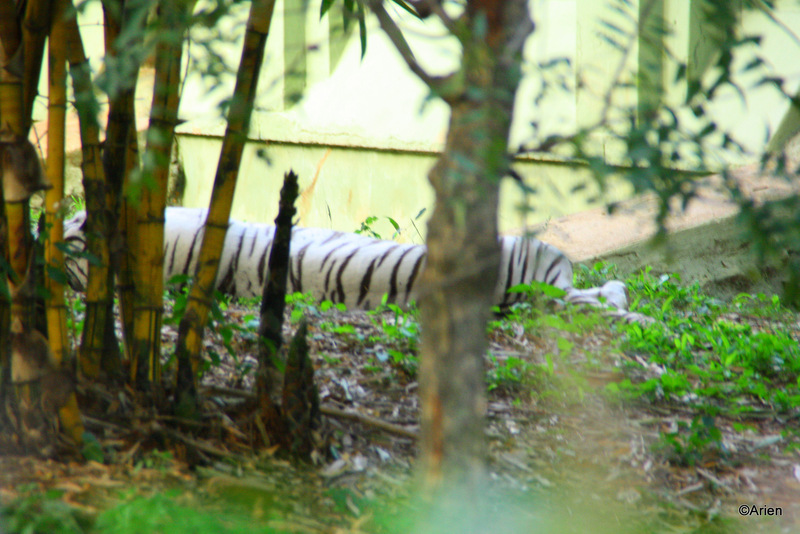 The second was of the white tiger that was fast asleep. It obviously could not and would not move while people goaded him to wake up and do something, anything. That seemed so cruel that we moved on. The arien took exactly 2 snaps and refused to take any more.His actual words were more to the effect that it was not challenging to take pictures of caged or captive animals and birds blah blah and so I had to be happy with what I got. Of course, this was before he saw the Usain Bolt of the animal kingdom. 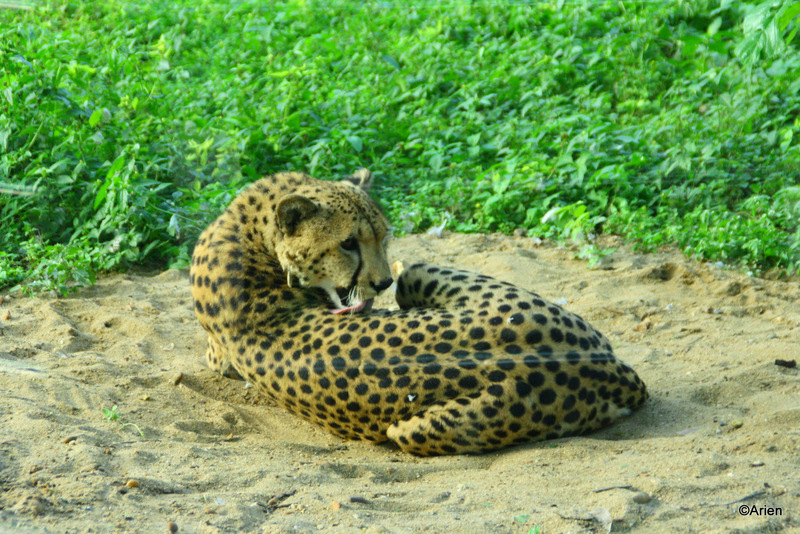 The cheetah was the latest addition and a great attraction in the zoo. All the people stood around the cage while the cheetah refused to look at us. Finally, he turned his face, and licked his skin very much like a cat and we got a nice shot of him. The last shot was of the black buck. 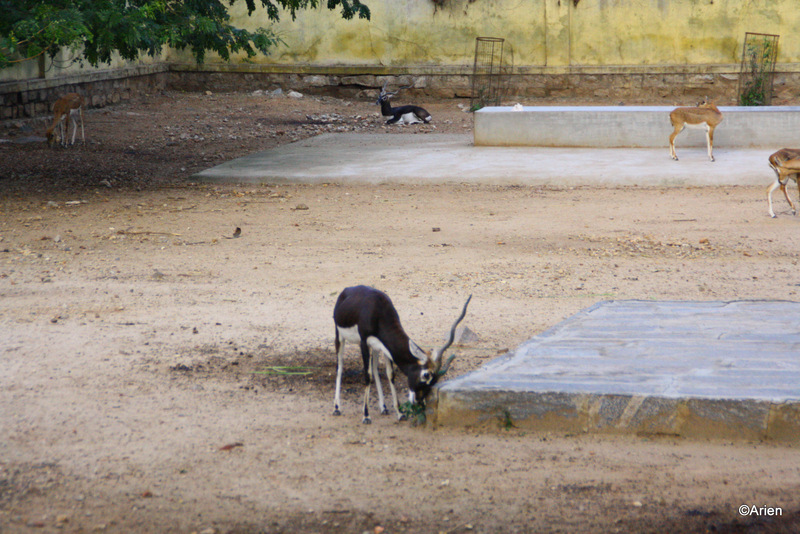 We visited Maidenhalli to see the black buck and so this was kinda like an easy shot. We usually struggle a lot to get a nice shot of the black buck and this seemed too easy that we really jes had to. We were driving back tomorrow and so that was the end of the Mysore trip. We had a nice but hectic time. It was fun. So after breakfast, we drove down to KRS. 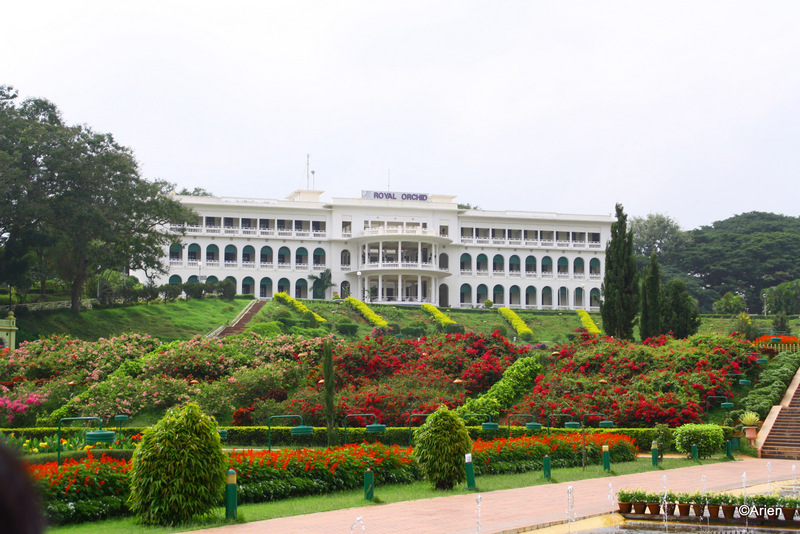 A favorite filming location or shooting location in the 60s and 70s – before producers opted to shoot out of India. It is beautiful to look at, at night. 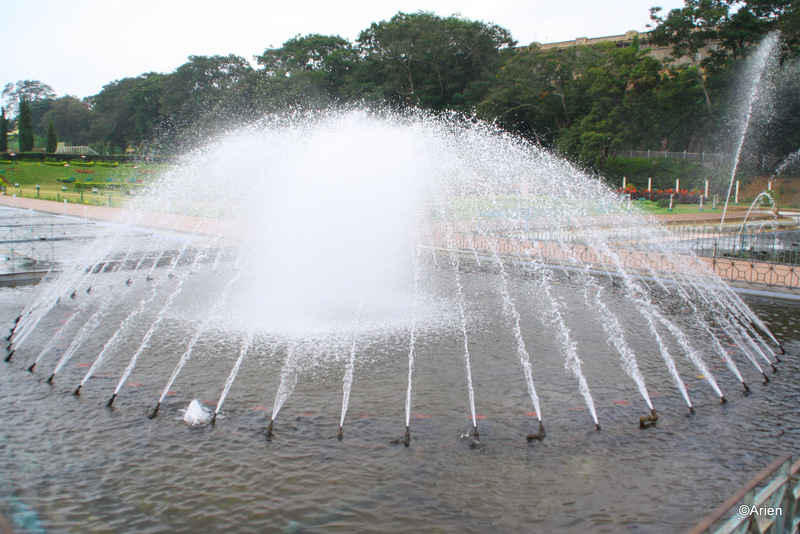 People used to come from all over to watch the fountains and tell others that they have been to Brindavan Gardens. Nowadays, it is not so popular and during the day, it was almost empty. This was good for us. The Arien could happily shoot pictures and I could walk along without worrying if we have lost sight of each other. We were there ~10 am and had ample time to walk around and watch the water display which the folks were kind enough to turn on, probably for testing. The Arien spent a lot of time perfecting his shot. It can be a bit boring but this time I had no complaints. I was wearing comfortable shoes and we basically had no one for company and so I walked ahead. We pointed to some of the locations that were used almost always in most of the songs of a bygone era and laughed. 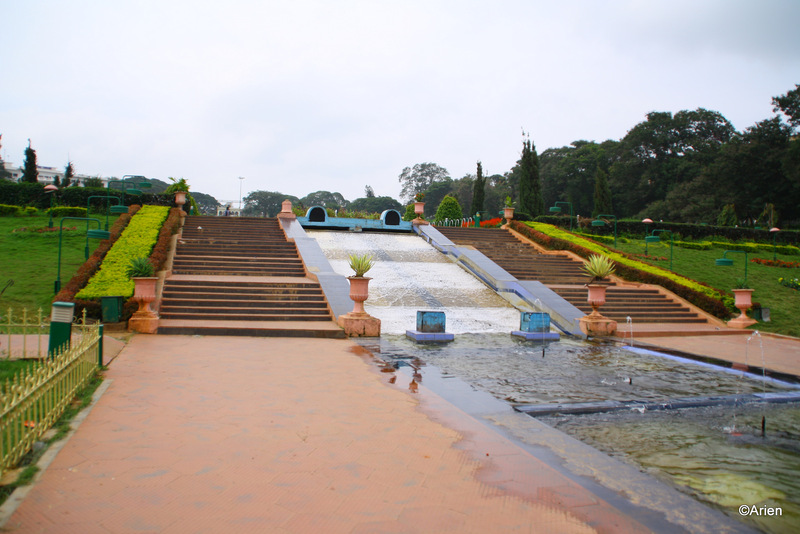 All the funny dance moves against the backdrop of the amazing Brindavan gardens was a bit too much to re-imagine. 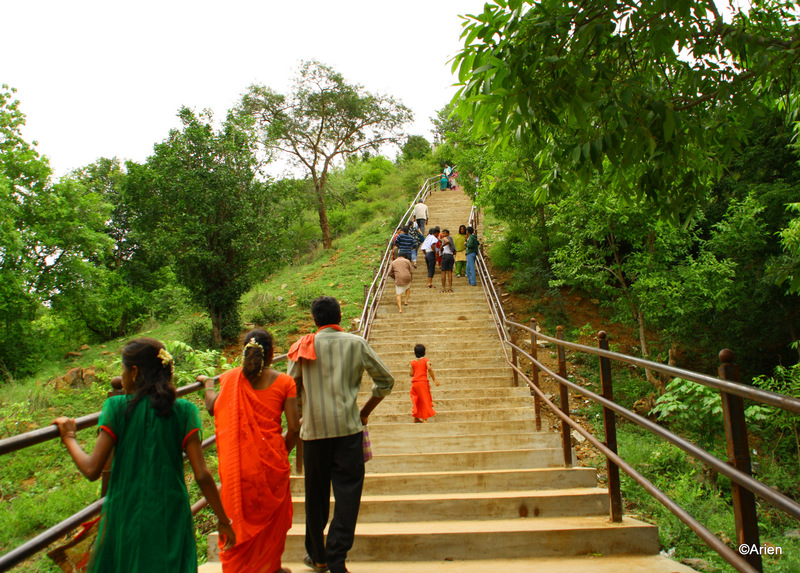 On the left is a pic of the steps that any Sivaji Ganesan and/or Muthuraman has danced. The heroine usually runs down the steps to match the music or stops mid-way and makes funny faces. It is quite comical. I mean no offense to fans of those movies/ that music/ those dance moves. On the right is a pic that I absolutely fell for – all the lamps in a row and the flash of red – simply beautiful it was. The Arien is now a serious photographer and talks about filters, lenses and what nots while I nod like I get it. Its all OHT right now. Anyway, the Arien was thrilled at the amazing shots he was getting and there was no one around which made the shots even better. We walked all the way to the end and we saw the Royal Orchid hotel. I told the Arien that we must really make it a point to stay there sometime so we can jes walk down and take snaps when no one will be there. It is kinda pricey though. 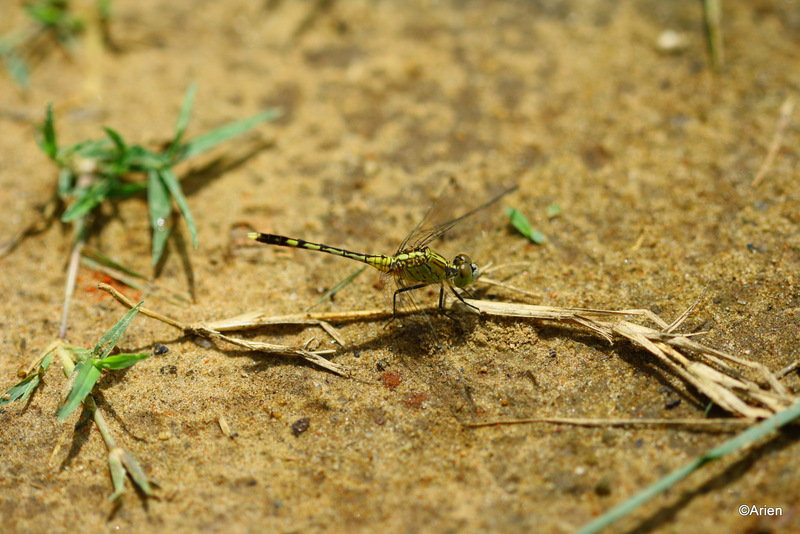 The Arien’s dragonfly mania took over yet again and soon he was shooting flowers and insects and insects on flowers etc. 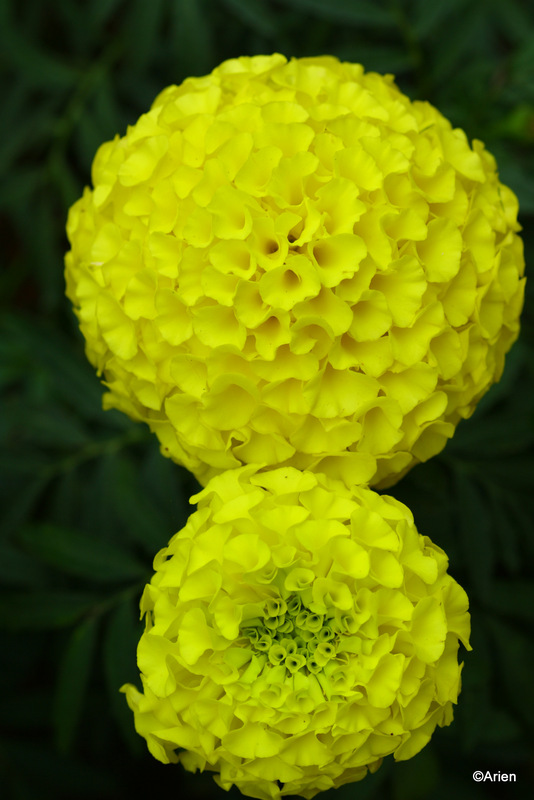 and sometimes shooting the same flower from different angles using different lenses etc. I was the caddy who gave him the lenses and carried the rest of the equipment and I was getting bored. We still had to visit the zoo later today and I was not sure if we could manage that today. The flowers were pretty, the spiders were not, nor was the dragonfly and so I’ll include the pictures of two flowers which really looked nice rather than the other stuff. 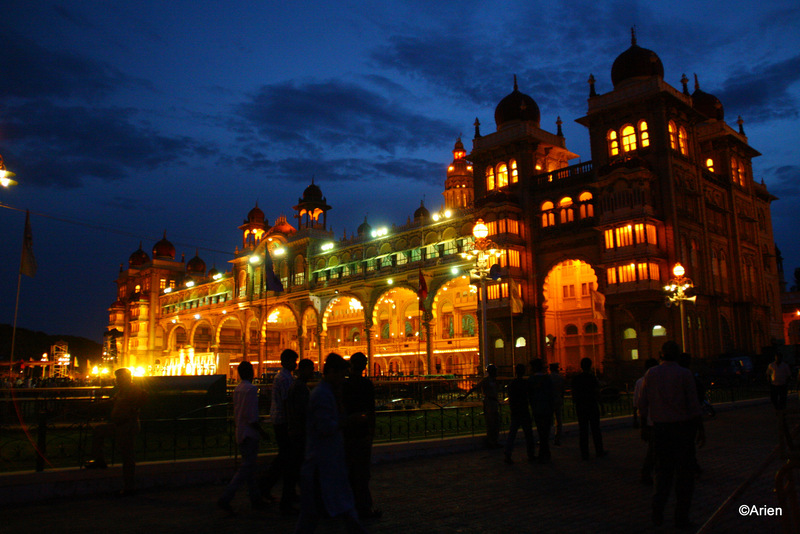 The same evening we decided to visit the Mysore Palace. The Dussera crowd was scary and I would have liked to say ‘we held hands’ but I think I was too frightened to let go of the Arien’s hands 🙂 Crowds in general have that effect on me – thanks to old hindi films (mela mein kho gaya specifically) which I watched mesmerized as a kid. We walked in late evening after a nap (we are on holiday, nap tho banta hai!) and while I worried we were too late, we were in fact just in time. I cannot resist masala puffed rice and they were selling them inside the palace premises. We spent a few minutes haggling over the price and when we looked up, the palace was all lit up and looked heavenly. 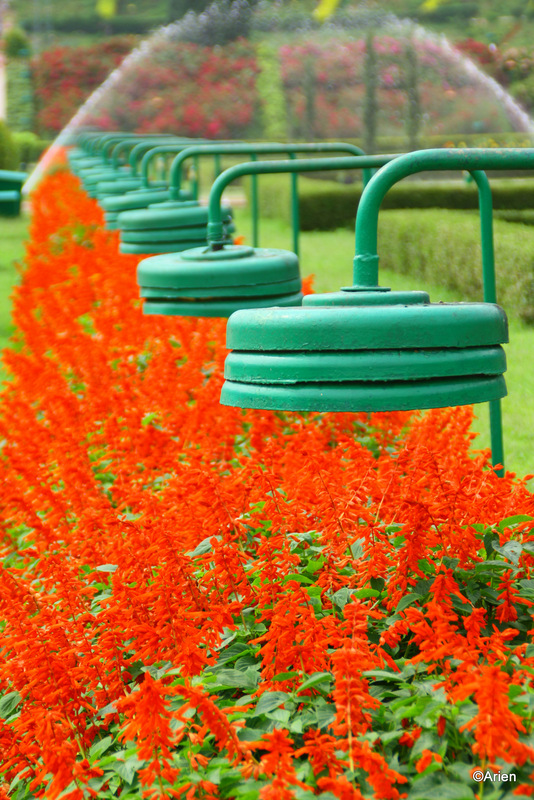 To keep the entire place so beautifully lit up must cost a lot of money which may or may not be equivalent to the money received as a result of tourist inflow. 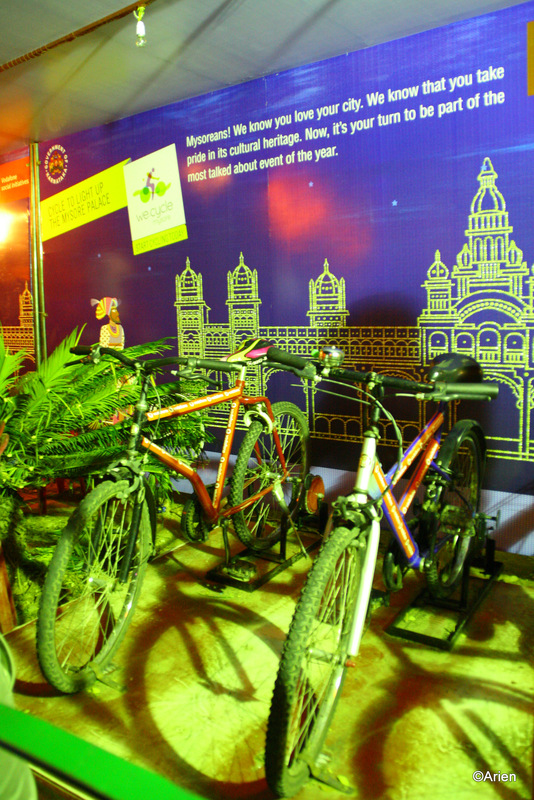 When these thoughts assailed our mind, we noticed that they had a cycle stall and everyone who cycles at that stall was actually contributing to some of the power required for the palace to be so beautifully lit up. Loved the idea. Did not actually cycle but there were so many folks who were eager to. We moved closer to the palace. As we moved away from the entrance, the Arien wanted to take a picture of the doorway from which we entered. It looked so beautiful now. I thought we should also take a picture of the other entrance for balance. On the left is the entrance from which we entered and on the right is the other entrance. We did not walk all the way though. There was ample security provided. Lots of policeman near the entrances and generally walking around. Both the entrances looked very well lit and was totally worth the trip. 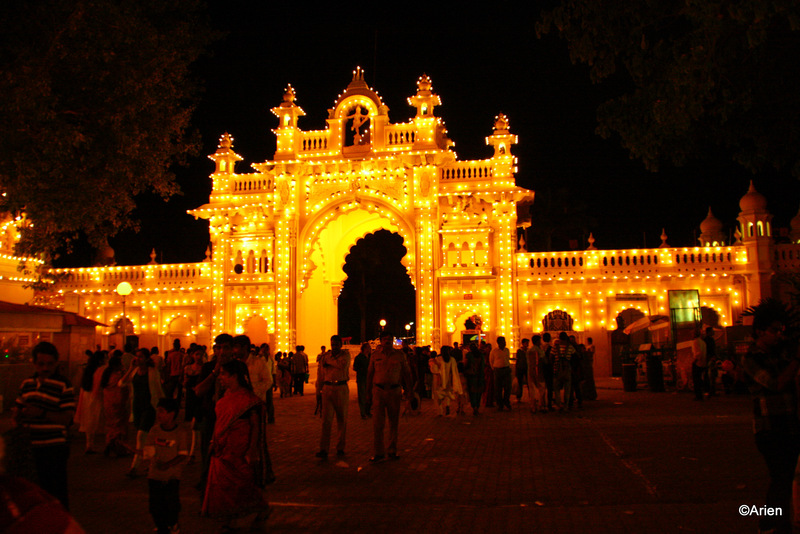 During Dussera, programs are also organized in front of the palace. A nice dais is created for artistes to sing carnatic music with accompaniments. There are ample seating arrangements for the audience. But, it is unfortunately not at all a match for the number of people who land up. The ample arrangements fell short of the actual crowd that landed up at the palace around at that time. There was a temporary structure – more like a scaffolding – on which logs were kept and we actually stood on that to watch the program. Lot of people were standing there and waiting for smne seated to leave so they could occupy that seat. It was that crowded. After a totally charged up visit, we headed out to our hotel after having dinner. It was a nice end to a hectic toursity day. 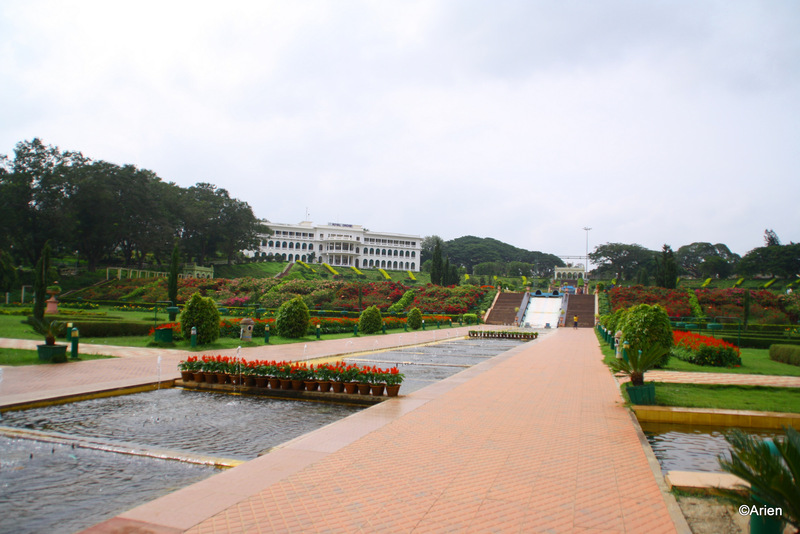 It is a very rare occurrence if we visit Mysore without spending some time in Ranganthittu. So, it was not a surprise at all that this was part of the plan. We started early but after breakfast and reached Ranganathittu around 9 am to find out that we were the only ones there! We had to either wait for a group or hire a boat just for ourselves. We decided on the latter and we were not sorry. The Arien got a couple of nice shots, sharing a few here. 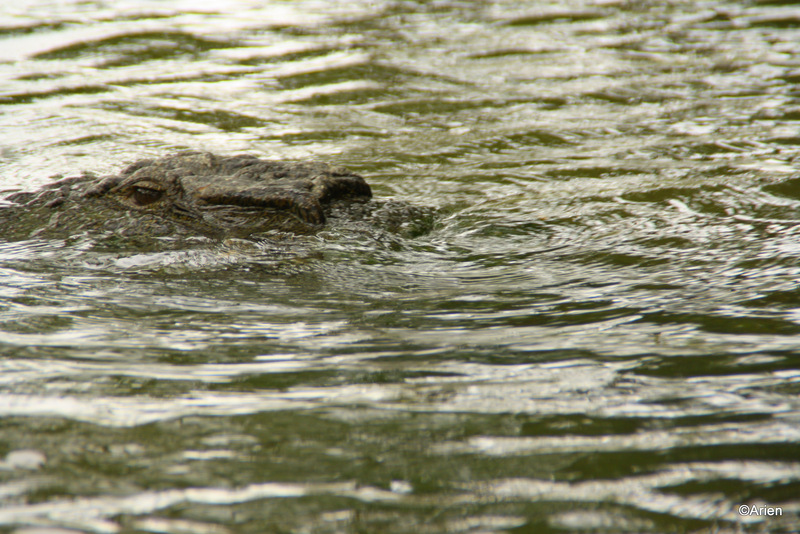 We spotted two crocodiles. Both looked scary and totally menacing in their statue poses. For a few seconds I mistakenly even thought that maybe it was only a statue of a crocodile and the boatman was only trying to provide us some value for money. And then the statue moved. It looked massive. I started praying for the boat ride to be over soon. Ya, I get very panicky at times. The other one was quite far off and appeared not to care too much about us. 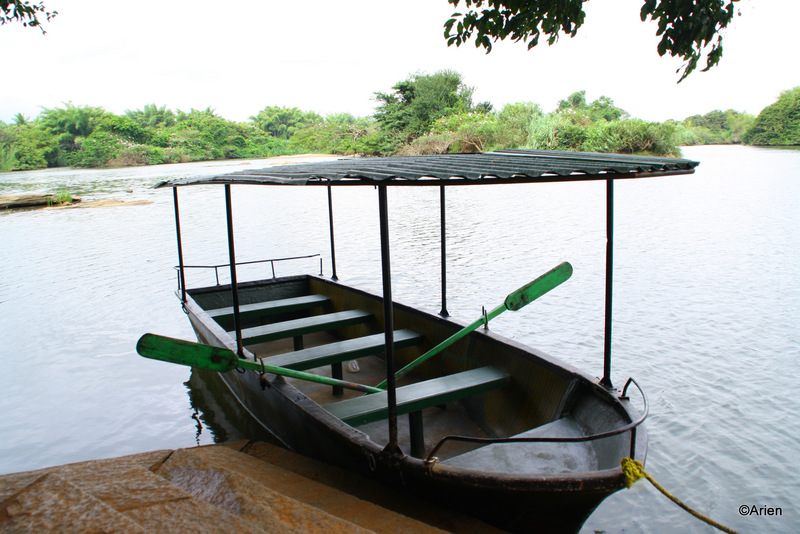 The boatman paddled, pointed out crocs, birds, and told us to come at a time when we can really see a lot of birds (i.e not now) etc. The Arien was glad for the info, I was trying to collect info for the blog post, and the boatman wanted to chat. Win-Win! 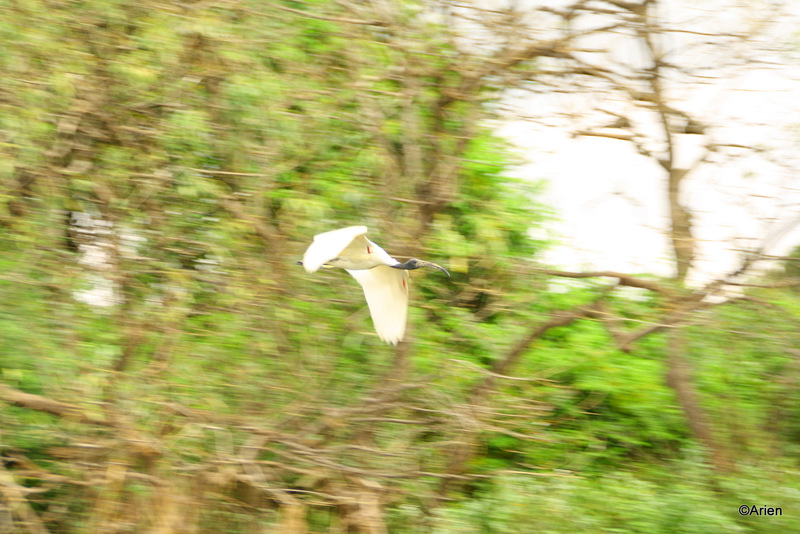 The Arien got a pic of the spoonbill in flight. It looked amazing and glorious in flight. We saw mostly spoonbills and so both of us were not so thrilled. Anyway, our next plan was to get to Sangam. Sangam looked exactly the same compared to when we visited last time with my mom-in-law. It seemed like a place untouched by progress. 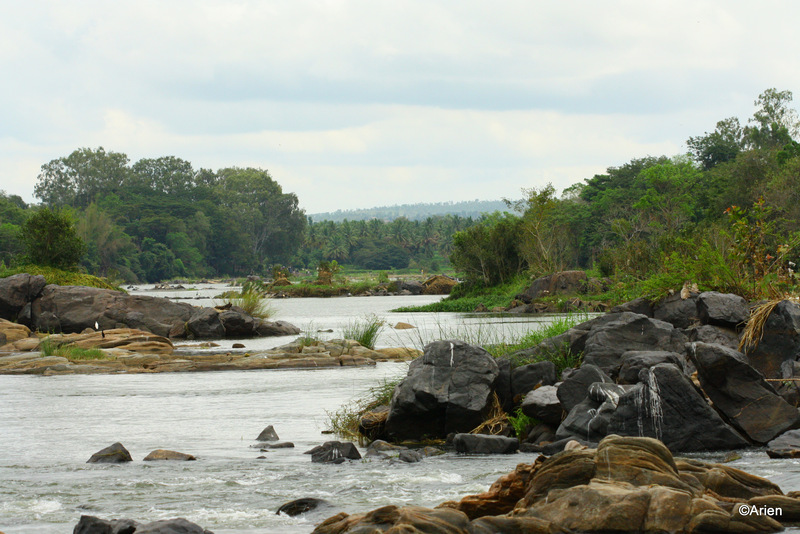 Its a holy place because of the meeting of three rivers. 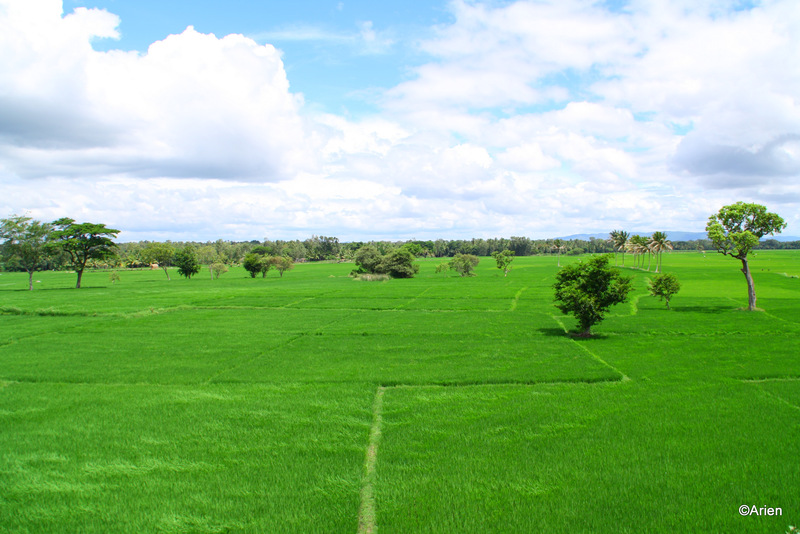 As a result, it is usually visited by folks to pay their last respects to their ancestors. Pujas are done here and so you may be in for a shock if you expect something else. When we visited with my MIL, a puja was going on the outside of the temple shown on the right. It can be a bit of a shock to see folks wearing traditional outfits and praying or performing homa or chanting after the priest when you have come on a holiday. 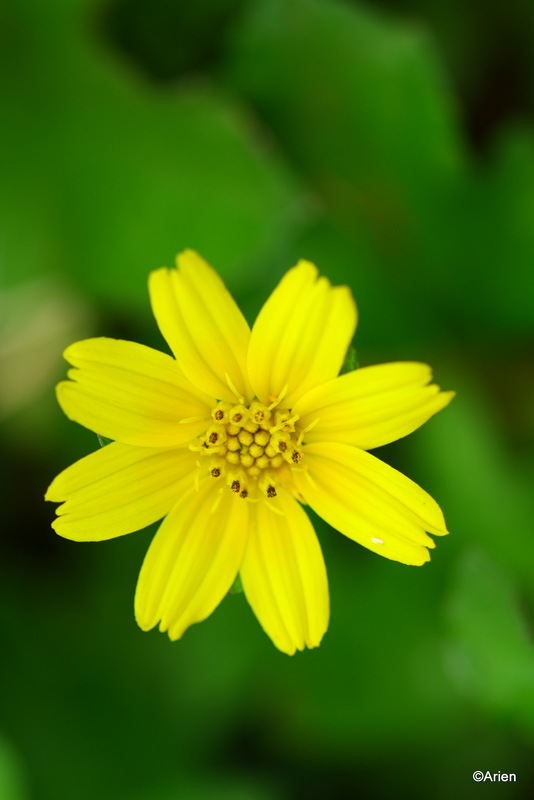 You may be viewed as a person showing a lack of respect and so you kinda cannot enjoy it much. Be warned! It is quite unsophisticated, natural, and definitely not clean. When we visited this time, there were no pujas going on. We spent some time sitting on the banks and resting our feet in the water. It was so silent and calm, it can seem a bit scary but otherwise there is nothing much to see or do. The picture on the left is actually view from where we sat with our feet in water. The water was amazingly cold and the whole place had a very calming effect on us. 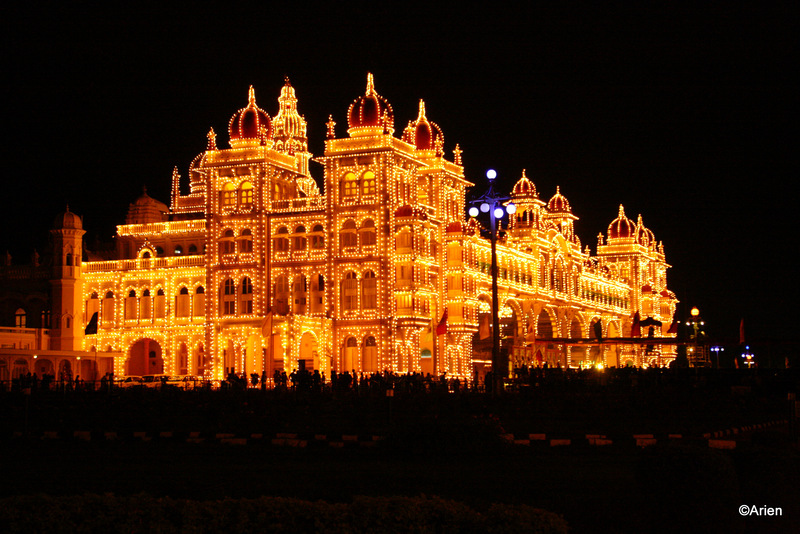 Coming up is the visit to the Mysore Palace. The day of travel to Mysore was a beautiful sunny day and the Arien was impressed with the clear skies and the amazing clouds and took quite a few shots of the clouds. Including just one, here. It was a drive we took frequently but the Arien felt we had not seen the beauty of the clouds in this manner before. Well, it was beautiful. 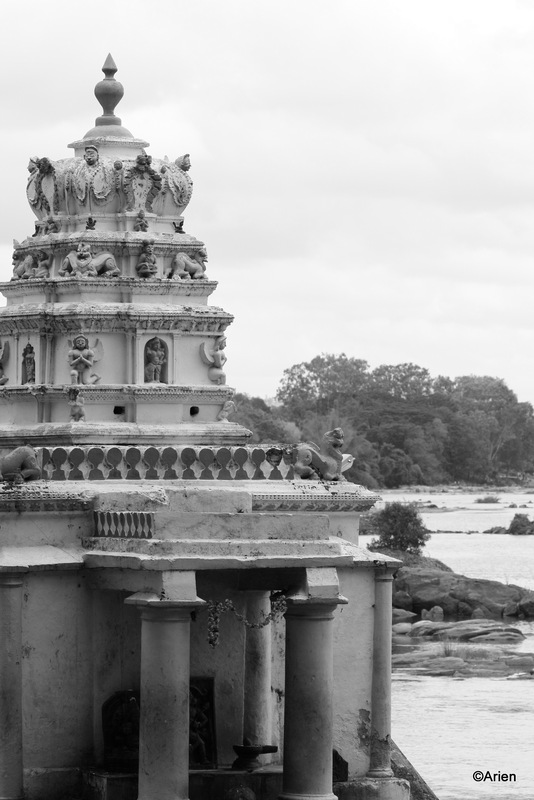 This year instead of going straight to Mysore, we decided to visit two falls that I had heard of before but never seen – before we went to Mysore. 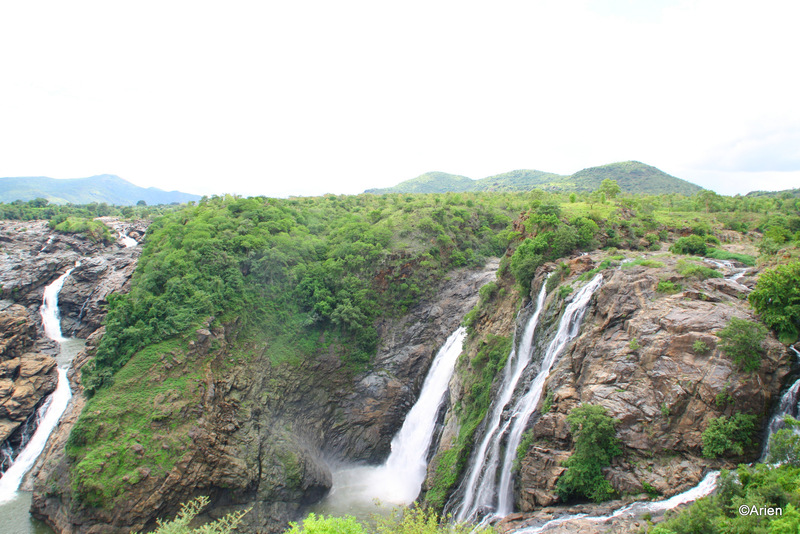 The first of the places we visited was Gaganachukki falls. 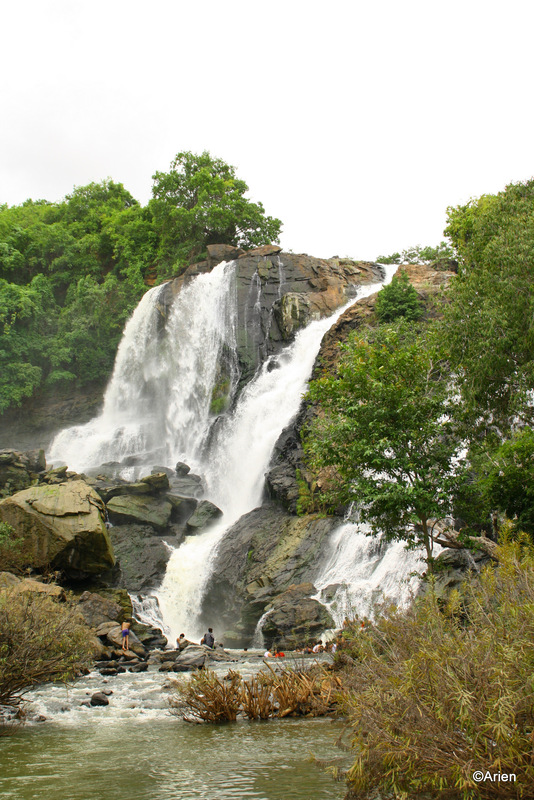 We also visited the Barachukki falls. The falls were beautiful but like most tourist places was crowded. Shots were difficult to get but we managed a few. It was not raining and so the falls did not look all that impressive compared to the pictures folks have posted on various sites. But, it was nice all the same. 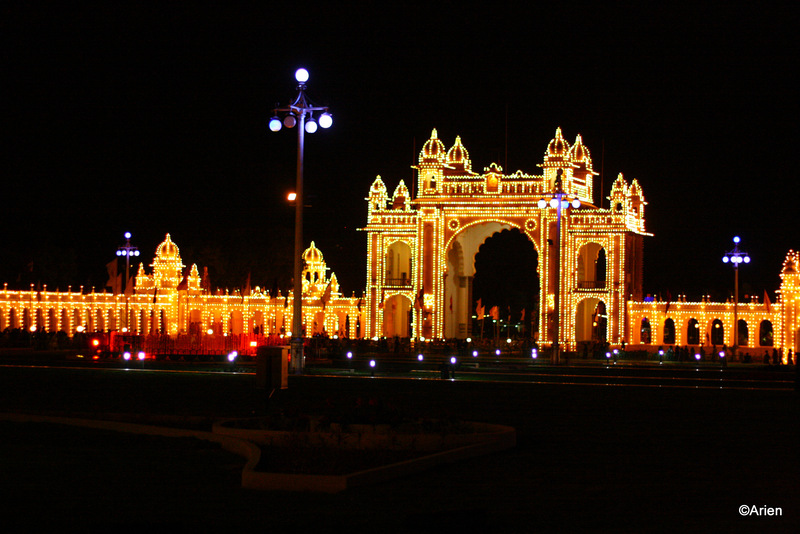 We usually like to visit Mysore once a year at least and especially during the Dussera time. 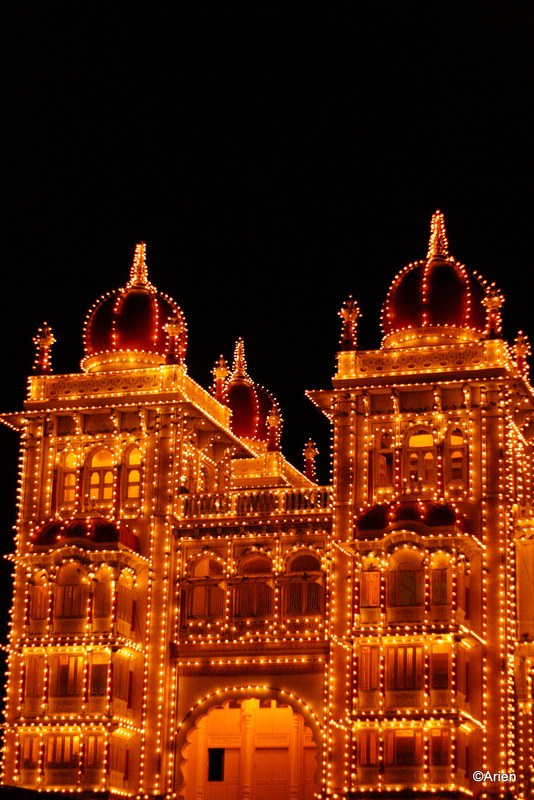 During Dussera, Mysore has a festive look, is quite crowded and is a great photo-op for the Arien. It is also quite a hassle to book hotels and find an okay place to eat but we still like to go. We time our vacation sometime between the beginning and the end so we do not have an awful time during the festivities.